The Red Bull 2on2 Revolution was inspired by the way NBA star and Red Bull Athlete Rajon Rondo plays the game – with all-out aggression, all the time. The tournament goes beyond traditional scoring by awarding premiums for all-around play. A new scoring system will award teams for attacking and dominating every aspect of the game. Teams will not only be awarded two points for baskets, but will also be awarded three points for steals, dunks over defenders, pinning shots on the backboard, blocked dunks, and making defenders lose their balance. 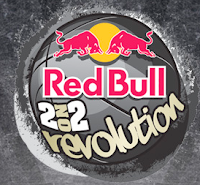 In a partnership with two of the premier basketball magazines in the world, Dime Magazine and Bounce Magazine, Red Bull 2 on 2 Revolution Boston is the first stop in a series of five tournaments to take place throughout the summer of 2010 along the East Coast. The winners of each competition will receive $2,000 and the honor of being named the Red Bull 2on2 Revolution Champions in their city. WHO: Local aspiring basketball talent, 18+ years old from the Boston area. WHERE: Jim Bradley Basketball Courts, Back Bay Fens. 1 Response to "Red Bull 2on2 Revolution - 7/17"
who won the tournament ?